Heavy rains in the past few days have not only caused waterlogging in various parts of Jorhat town on Thursday but also washed away a small concrete bridge over a stream, disrupting communication between Udaipur No 1 and Udaipur No 2 villages near Mariani bordering the Mokokchung district of neighboring Nagaland. Deepak Tanti, vice-president of the Assam Tea Tribes Students’ Association (ATTSA), Jorhat district unit, who lives in the vicinity said that Mariani MLA Rupjyoti Kurmi, Jorhat MP Kamakhya Prasad Tasa, Deputy Commissioner Narayan Konwar and other district administration officials including PWD had visited the site and strict instructions had been issued to rebuild the bridge immediately even if in a temporary manner for the time-being. “Tasa had assured the people that work would start from tomorrow itself and a temporary bamboo bridge would be erected in the next few days,” Tanti said. Tanti said that the concrete bridge had been constructed over the stream, which was now in spate and broadened out to a rivulet, in 2001 but in a couple of years it had got damaged and had tilted to one side. Now it was completely destroyed. “Most of the children from Udaipur No 2 village could not attend school situated on this side and a few came in a roundabout route,” Tanti further said. The students’ leader said that the rivulet flowed down the hills in the Desoi Valley Reserve Forest area and that the route was also used for trade by villagers residing in Ao Sangum and Ao Senden in the Mokokchung side. 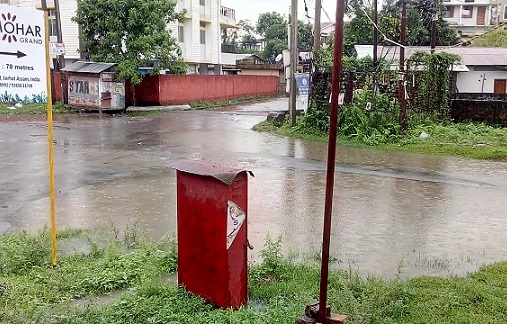 Elsewhere in Jorhat, river waters flowed through the streets in the morning but cleared up after some time through a well-connected network of drains put into place by the previous Congress Government and work continues to broaden out the drains in some other areas.